Here's a nice little spread I prepared for you to try on the Lunar Eclipse; I personally found it to be most insightful and enlightening. ​You can use it in either the predictive or personal development sense. 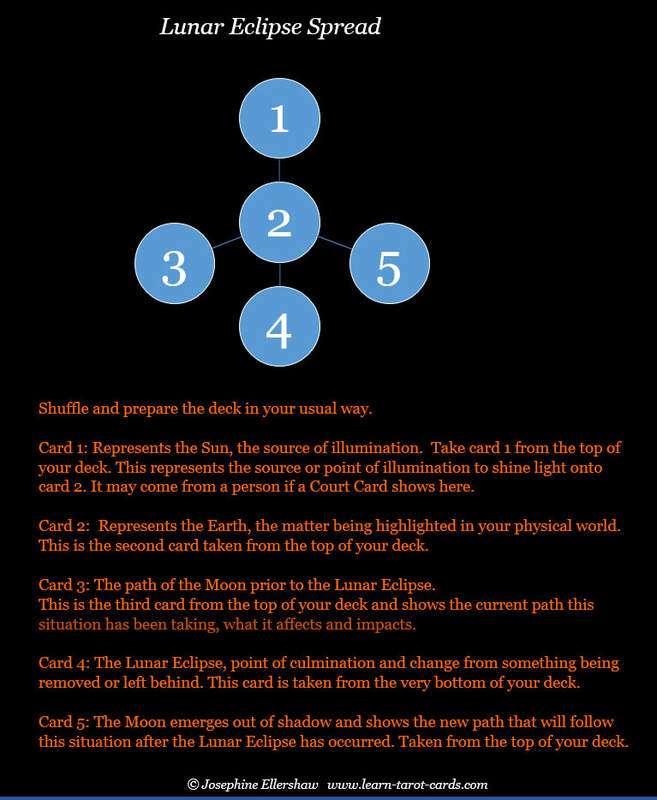 The steps are presented as if you were asking the cards, "What is the focus of the Lunar Eclipse on my life?" If you're using it for personal development and inner work, then card 4 would be what you're advised to release. To give you an example, these are the cards that came up for me and they were very much on point. For those of you who aren't familiar with my style of Tarot reading, it's more similar to Lenormand and European Cartomancy methods. I recognise the lady in Card 1 as someone who's familiar with the situation that has shown itself (in card 2) and has been a good listener, sympathising and offering kind words. This is very much a central issue that's been bothering me and is related to work that I'm publicly known for (card 3) and have done well. Sadly, the Five of Swords throws the spotlight on some dubious tactics that have been going on for some considerable time, where the content of my work and site has been constantly followed, copied, tweaked and morphed into someone else's work; it's called 'swiping,' apparently. It began with adapting the marketing blurb from the back of my book, that Llewellyn wrote, and gradually gathered steam from there. This has become more aggressive of late, particular areas targeted, and any changes I made followed within days. The content and notes from my course (only available to private students) was leaked quite some time ago... Doing some research I just discovered there are online tools available where you can track a site to enable this type of behaviour (who knew? I mean, seriously!) Not only has it deeply saddened me to see this happening and used in what we consider to be a spiritual field, but it's now having a detrimental effect on my business and livelihood. I'm just a one-man band, in case you hadn't realised. I potter along and do my thing, provide a service to others and pay my bills. Strength is quite apt as it shows how I've been dealing with this to date, endurance and quiet determination in the face of difficulty, diplomacy and taking a gentle approach, etc. As a Queen of Swords I've been quite proud of myself to show restraint and turn the other cheek in what has become an exasperating and exhausting situation. However, one way or the other, whether by choice or some Universal grand design, it looks as though that's about to be removed. Thankfully, the new path that follows (card 5, Ace of Cups) takes me forward onto a new, happier and more fulfilled path. I've been as open as I can in what is obviously a very private reading but in the hope it helps to show you how the cards can be applied.